Tractor trailers have sometimes been referred to as “trains on wheels.” They are large; they are fast; and they pose an extremely hazardous risk to those on the road. Sadly, this week a horrendous collision was caught on film, and demonstrates the destruction that these vehicles can cause. While this collision may appear to be as simple as any traditional collision in which a driver runs a red light, it is not. Interstate motor carriers are regulated by federal legislation. The federal regulations place requirements upon the motor carriers to not only ensure that the drivers are acting responsibly but also to ensure that the companies that employ the drivers are acting responsibly. It can be easy for an attorney to see this video and to believe that this is a clear-cut case against the driver and to accept a settlement from the driver’s insurance carrier. That might not be the only avenue for recovery for those injured, and, unfortunately, that insurance policy might not be adequate enough to provide for recovery for all those injured. Additional questions need to be asked: why was the driver not paying attention; had he been driving for more consecutive hours than the regulations require; did his company properly train him on the hour requirements under the regulations; was he an independent contractor or was he a statutory employee of another company with more available insurance? These are questions that cannot be overlooked by the attorney in the desire to resolve the case swiftly. Frequently, in cases such as these, there are layers upon layers of insurance that the plaintiffs can identify if they take their time and discover the facts. It is important for the work to be done before agreeing to any potential settlement. Tractor trailers present serious and grave concerns to those on the road ways; because they do, there are regulations that impose liability on more than just the driver and the attorneys investigating these cases need to identify all aspects of liability. 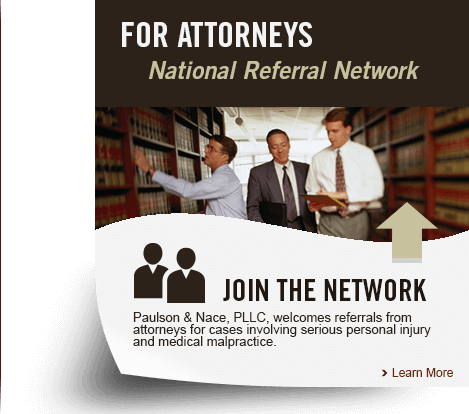 Here at Paulson & Nace, PLLC with take the time to make sure that in such cases we evaluate all avenues of liability and exposure to ensure that we can arrive at the best outcomes for our clients.